SO SOPHISTICATED! Check out this Ivory Jumpsuit for an easy and elegant choice. Must have look for Summer time and the Tan belt is included! I bought this worried that I may not fit in it because my hips are 1 inch bigger than the size chart recommendation. The material has some stretch to it and I think it fits pretty well. 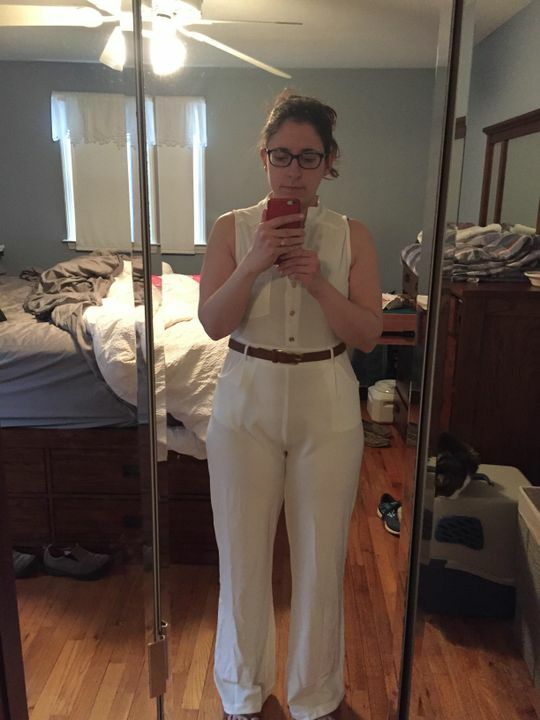 I am excited about the jumpsuit because I personally am very self conscious about my legs so it is nice to have something that looks nice for a dressy event (or business event) and keep my self esteem up :). I am 5'5" and with a 3 inch heel (or wedge) this is the correct length for wear. This quality is beyond incredible! Shipping was super fast, ordering is super easy, sizing is perfect. To top it all off the quality of the material is unbelievable! This will last me for so many years to come and I cannot wait till the spring to show off this outfit at my office job!